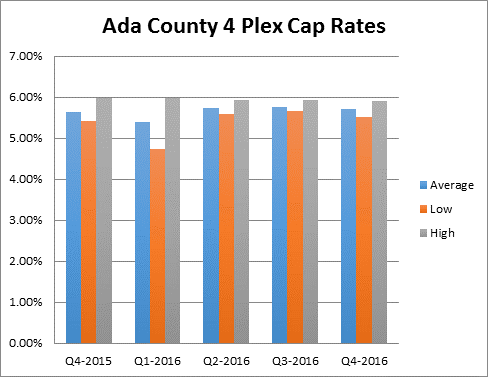 The Ada County Assessor's office recently hosted the 2017 Real Estate Symposium. The panelist were Mike Turner with Front Street Brokers, Tony Drost who represented both First Rate Property Management and Swope Investment Properties, and Terry Heffner with Guild Mortgage. FRPM has reported that the new generation of renters seem to prefer renting for a number of reasons, like flexibility and not having to do any maintenance. One interesting point that Terry Heffner discussed in his presentation was that a number of college graduates with good paying jobs are having difficulty qualifying for a home loan due to large student loan debt. That information helps us better understand why we are seeing young professionals who have good income, good credit, and cash reserves, are renting versus buying. Tony's was asked to present on: 1) 2016 rental market trends, 2) vacancy, expenses, concessions, and rental rates, and 3) Tony's predictions/corrections envisioned for 2017. We wanted to share some of the information Tony presented. 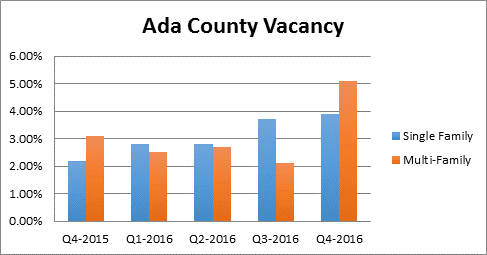 The below graph shows the average vacancy for single and multi-family units regardless of bedroom count. 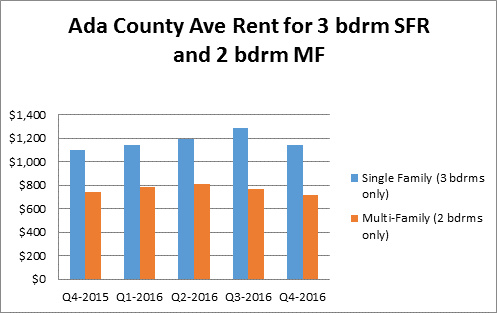 Notice that single family vacancy is trending upward and multi-family had a spike in the 4th quarter of 2016. 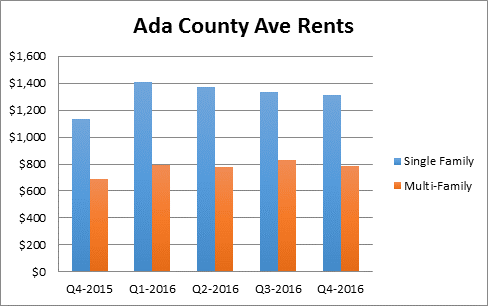 Overall, average single family rents increased by 16% from the 4th quarter of 2015 to the 4th quarter of 2016. However, average single-family rents descended the last 3 quarters. Multi-family rents increased by 14% in the same time period. However, like the vacancy averages, these average rents were based on all rentals regardless of the number of bedrooms, which prompted the next graph showing average rents for 3 bdrm homes and 2 bdrm multi-family units. In this graph, we only look at the rents of 3 bedroom homes and 2 bedroom multi-family units, since those are the most common. Unlike the prior two graphs, this graph actually shows a perfect rental cycle. The Boise area is a true 4 season area. Typically rents are strongest in the 2nd and 3 quarters. Where the first two graph's suggest some concern with single family rental homes, this 3rd graph suggests that they are following the normal rental cycle for this area. The average GRM was 127. Due to strong rents, cap rates have been stable. This differs from the bubble of 2005 and 2006 where values increased where rents had not. As a percent of gross income. 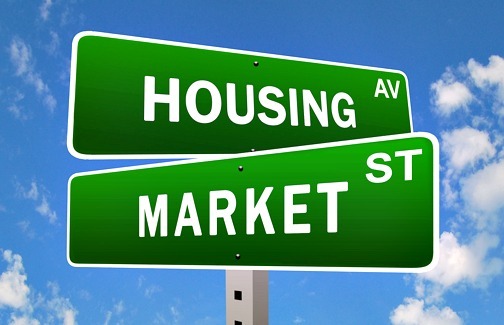 Some data suggests that the single family market is softening. Other data shows that rents and vacancy are simply following the rental market cycle. Initially, Tony felt that we might see the single family rentals continue to soften, but after hearing the other speakers and the other factors, such as increasing loan rates, increasing home prices, and scarcity of affordable homes, perhaps this is not the case. 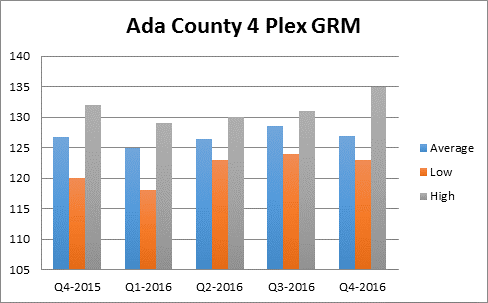 Outside the Q4 jump, vacancy has been impressive and rents increased by almost 14% since the 4th quarter of 2016. If population and employment continue to grow, Tony doesn't see any indications that the multi-family rental market is slowing. The amount of new construction scheduled and the timing of their completion may prove me wrong.